Is there anything more special than encountering someone who has a vision for doing something that is right in line with the hopes and dreams you have for your life, your family, your child, or your business? Last week Steve and I were asked to be vendors at a private home boutique and there, on one corner of the dining room was such a happy encounter. 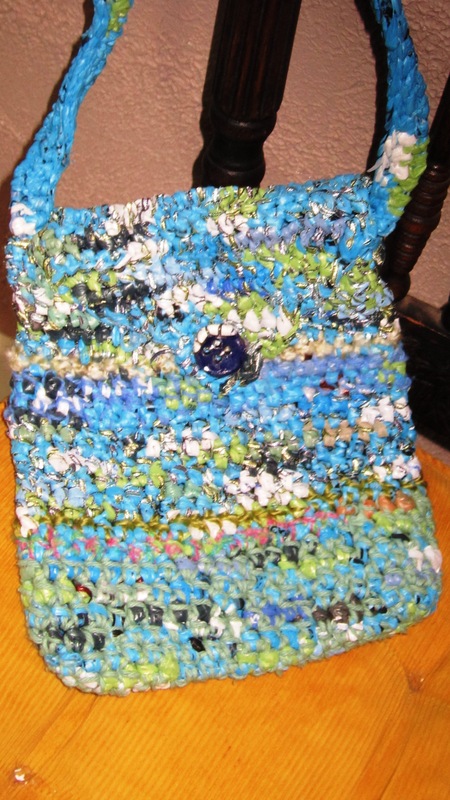 Lovely and colorful, well crafted handbags that were made of great wool, hand knit and felted (When i was little we called it shrinking, and in turning your adult large sweater into something a child could only fit – today it is called felting.) 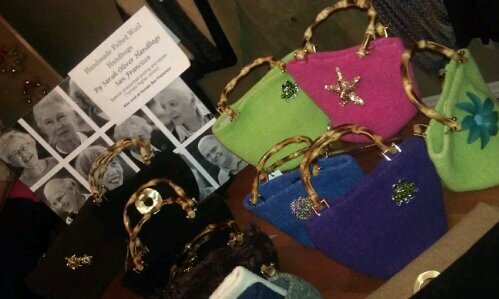 The company is called Sarah Oliver Handbags. Sarah lives in San Francisco and began knitting as a hobby, making purses for people and the demand grew…and grew… and grew. So much so that she had to source out help. She visited a senior independent living establishment, and worked with an activities director to source out 11 women (she called them Purlettes) and 1 man (she calls “plus one”). I was so moved when i read the story, and spoke with the local gal that is the distributor in Northeastern Ohio… In fact i was so excited about it that i looked up her website, found her email and shot her a brief email asking if we could talk. My dream is real… my passion to turn ReBlooming Bags into something that is a game changer for the people making the bags, and for the world, in that upcycling that much plastic is bound to reduce the supply in land fills. So we have been emailing back and forth… Wow, a real live entrepreneur with a proven track record, successful sales, national distribution… and yet humble enough to take time to speak with me. I really love this adventure. That said, she has ignited the fires for me to actually get that help with a video, and finally put that kickstarter proposal out there. Kickstarter.com is a web site that offers something called “crowd funding”… simply the proposals are out there, and through an advertising campaign I have either 30 or 60 days to attract people to fund my project. If the funding pledged meets my goal or exceeds it the project is funded… if it does not meet the goal nothing happens. The proposal has to be for a project… In my case it will be a limited run on urban mini over the body handbags, fully lined. I know they sell, and I know the market will respond and buy them. They are not elaborate to make, and a standardized size will prove that the differentiation comes with the use of the different colors of plastic bags, and old sweater yarn. I am beginning to believe we can do this thing, and employ a few people to produce the ReBlooming bags for me. So say a little prayer that this will happen…. I was supposed to do the video this weekend, however i lost my voice friday… first time in 30 years i had laryngitus…. doctor assures me it is viral, and lots of fluids and rest the voice. OK… i can do this… and so many of you have encouraged me over the years about this…. This is an amazing and well thought out project… and a great example of what Kickstarter can do. And meeting Sarah by email and phone has been wonderfully motivating and encouraging to me.